Luis Fonsi, Daddy Yankee, and Justin Bieber’s “Despacito” is the most authentically Latin chart-topper the U.S. has ever seen. Could it be that we already know the Song of the Summer? This year, contenders are taking their turns atop Billboard’s Hot 100 exceptionally early and rapidly. Just since late April, the revolving door at No. 1 has been remarkable. Four new songs topped the chart in four consecutive weeks: tracks by Kendrick Lamar, Bruno Mars, DJ Khaled (with an army of supporting vocalists), and now Luis Fonsi (with one of those same vocalists—more on him in a minute). Billboard reports that this is the highest turnover in the No. 1 slot since 1990, the pre-SoundScan, pre-computerized era of chart tabulation. Some of this turnover is data-driven happenstance, but I attribute the heated competition for No. 1 to early jockeying by major music stars for prime slots in 2017’s beach-boombox season. Out of all of the contenders, though, the one that’s likeliest to take the Summer Song title is the one that seemed most unlikely to be No. 1 at all—the song on top right now, which is largely in Spanish. That would be “Despacito,” by Latin music veterans Luis Fonsi and Daddy Yankee, in a remix featuring the biggest male pop singer of the 2010s, Justin Bieber. In the remix, Bieber leads off with a quick English verse before turning over the mic to Fonsi, who sings mostly in Spanish, and Daddy Yankee, who raps no English lyrics at all (save a quick “bang-bang”). The Canadian Bieber, who has scarcely a scintilla of Latin heritage, sings and harmonizes in Spanish for the rest of the song, a first for him. By providing prominent vocals on both DJ Khaled’s “I’m the One” and this, the track that ejected it from the top spot, Bieber becomes the first singer in Billboard history to score new No. 1s in back-to-back weeks. (About a dozen other artists have succeeded themselves atop the Hot 100, but in all prior cases the second hit took at least a few weeks to replace the predecessor.) It’s an extraordinary hot streak for Bieber—“I’m the One” and “Despacito” are his fourth and fifth career No. 1s, all amassed in a 20-month period dating back to “What Do You Mean?” in September 2015. Now in its second week on top, “Despacito”—whose title is Spanish for “slowly”—has the kind of upward momentum going into Memorial Day that often makes for an eventual summer-song winner. Unlike other contenders such as Khaled’s “I’m the One” or Lamar’s “Humble,” both of which opened huge but were heavily front-loaded, “Despacito” grew into the No. 1 spot, and at this writing its sales, airplay, and streaming are only expanding. (And there isn’t even a video featuring Bieber yet, which when it inevitably drops will only supercharge the song’s chart fortunes.) This broad-based U.S. acceptance of a song whose lyrics are less than one-quarter English makes it the year’s definitive crossover hit. But the truth is, “Despacito” was already a crossover song, and a smash, in its prior incarnation, when none of its lyrics were in English at all. To Latin music fans, Luis Fonsi has been a core artist for a long time; indeed, a generation of under-25 Hispanic Americans probably can’t remember a time he wasn’t on their radio. Never especially hip, Fonsi has been both a reliable hit-maker since his career launched in the late 1990s and a relatively conservative one, famous for the sort of florid orchestral balladry that is the bread and butter of Latin pop radio. In the mid-2000s, he made a move toward more guitar-based, rock-inflected tracks (not unlike the move by Anglo pop acts like Kelly Clarkson in this period), but he still favored trim ballads, like “Nada Es Para Siempre” (“Nothing Is Forever”) or “Tu Amor” (“Your Love”). It was also late last year that Fonsi, now 39, had the savvy idea to team up with Daddy Yankee for a radio single. 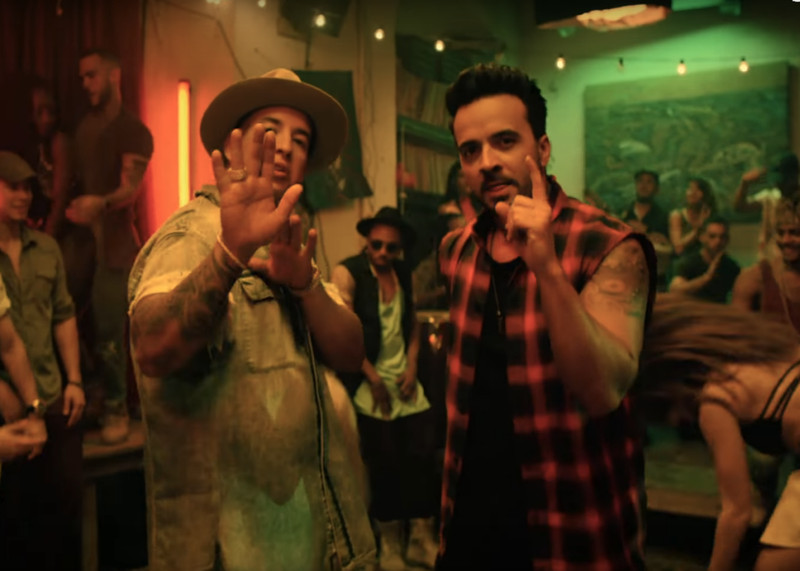 The result, the original all-Spanish version of “Despacito,” was a perfect blend of the two men’s sounds—you can hear the cross-pollination in the song’s first minute, which leads off with a bit of Fonsi-style acoustic guitar before the DY-style reggaetón thump-tha-THUMP kicks in. Not incidentally, the song is also a kind of Boricua summit: Fonsi and DY are both natives and favorite sons of San Juan, and the song’s lyrics even name-check Puerto Rico and throw in a suitably Puerto Rican “¡Ay, Bendito!” for good measure. The original Fonsi–Daddy Yankee video, shot last December in San Juan, is like a travel agency promo reel for Puerto Rico at a time the debt-burdened U.S. territory could badly use an infusion of tourism cash. Given that it joined two of the biggest Puerto Rican megastars and progenitors of the two dominant forms of Latin pop for one commanding single, it was no surprise that “Despacito” was an instant smash. Released in January, it topped charts worldwide, in about a dozen Latin American countries, and debuted all the way up at No. 2 on Hot Latin Songs, Billboard’s chart that tracks U.S. Spanish-language airplay, sales, and streams. “Despacito” topped that chart in mid-February and is still there, now in its 16th week at No. 1 on Hot Latin Songs, and it shows no sign of slowing down, especially now that the Justin Bieber remix is out. The song was in roughly its second month commanding Latin charts around the world when, as Fonsi tells it, Bieber heard the track while on tour in Bogotá, Colombia and was captivated by the tune. Honestly, who can blame him? The greatest asset of “Despacito” is the chorus’ irresistible descending melody (“Des. Pa. Ci-to … ”), which is singalong-able by the end of your first listen. Spellbound, Bieber—who had already milked the so-called “tropical house” boomlet to his own ends and, like a modern rapper à la Drake or Kanye, has basically become a kind of coolhunter-curator these days—reached out to Fonsi’s people and offered to record the remix. It dropped in late April and hurtled the song into the Hot 100’s top 10 instantly. What distinguishes Justin’s “Despacito” contribution from the pop-radio gold dust he’s scattered on hits by Major Lazer, DJ Snake, and the aforementioned DJ Khaled track over the last year is that Bieber was integral to the creation of those three prior singles; all were conceived as showcases for him, notwithstanding Bieber’s official “featuring” credits. Whereas the Bieber vocal on “Despacito” was an afterthought and by all rights it should feel the least organic. Indeed, the opening English verse is incongruous and slightly hokey. But on the Spanish chorus, Bieber’s sweet, buttery vocals turn out to be ideal for Latin pop, as he harmonizes with Fonsi seamlessly. Bieber has to be regarded as the X-factor that got “Despacito” to No. 1, because foreign-language smashes on the Hot 100 are few and far between—whether it’s the Italian-language “Volare” (No. 1, 1958), the Japanese “Sukiyaki” (No. 1, 1963), the German “99 Luftballons” (No. 2, 1984), or the Austrian-German “Rock Me Amadeus” (No. 1, 1986). In the latter two cases, many Top 40 radio stations opted to play Nena’s and Falco’s awkward hybrid-English versions. Among Spanish-language hits, “Despacito” has few historical antecedents. For those keeping score, the Bieber version is 78 percent in Spanish, which makes it comparable to the last mostly-Spanish No. 1 on the Hot 100: “Macarena (Bayside Boys Mix)” by Spaniard duo Los Del Rio in the summer of 1996, a single whose American version similarly contains an awkward, tacked-on English verse. Honestly, xenophobes fearful of the takeover of ’Murican culture by Spanish-speakers might consider just how thin the history of Latin-to-pop crossover in this country is. In Hot 100 history, the only other Spanish-spoken No. 1 is the cover of Ritchie Valens’ “La Bamba” by East Los Angeles band Los Lobos in the summer of 1987 (also the only Hot 100 No. 1 entirely in Spanish). Lobos covered the song for the soundtrack to the English-language Valens biopic of the same name starring Lou Diamond Phillips. So in all three cases—“La Bamba,” “Macarena,” and now “Despacito”—some form of English-language crossover X-factor was necessary to carry the single to the top: respectively, a Hollywood movie, a Miami-based English remix coupled with a dance craze, and an appended verse from pop’s biggest male star. “Despacito” is also distinct from the last era in which Latin-derived music crossed over at U.S. Top 40 radio: the so-called Latin-pop boomlet of 1999, a fun, harmless, and fairly inauthentic bit of cultural hybridization. Kicked off by a now-legendary megawatt performance by rising star Ricky Martin of his World Cup anthem “La Copa de la Vida” at the 1999 Grammys, the boomlet saw Martin, actress-turned-singer Jennifer Lopez, her future husband and legit salsa star Marc Anthony, Latin-music scion Enrique Iglesias, and Rock and Roll Hall of Famer Carlos Santana all scoring massive U.S. pop hits. But it wasn’t actually much of a crossover moment—all of the hits were in English. (Even Igelsias’ chart-topper “Bailamos,” which was total Anglo pop beyond its title.) And the songs were conceived for U.S. pop radio first and bore few ties to the songwriters and production sounds of then-current Latin pop. Martin’s blockbuster “Livin’ la Vida Loca” was penned by Desmond Child, the songwriter-for-hire behind three prior Bon Jovi No. 1s. Lopez’s “If You Had My Love” was assembly-line pop-and-B from producer Rodney Jerkins. And Santana’s “Smooth” was co-written and sung by Matchbox 20’s Rob Thomas. Essentially, ’99’s Latin explosion was a magazine listicle masquerading as a genre: a bunch of pop acts with varying forms of Latin radio bona fides, largely singing in English in the year of peak Total Request Live. The movement was also short-lived—it lasted just long enough for Colombian rock star Shakira to successfully follow the English-crossover playbook in 2001, but by 2004, Luis Fonsi’s own attempt to record in English utterly flopped, and Cuban performer Pitbull had to convert himself from a reggaetón-style rapper to a club-pop frontman to start scoring serious U.S. hits. In short, “Despacito” is unique, even if it took a white Canadian pop star to bring it to No. 1. It’s arguably the first authentic Latin pop song to top the big chart, the truest representation of what the music actually sounds like on Spanish-language radio to cross over to anglophone audiences. True, it was conceived by Fonsi as a multigenre Frankenstein’s monster from the outset, and as such the track is not a pure representation of any one strain of traditional Latin music. There’s no bachata or ranchera in it—although the song is now such a smash that cover acts are swooping in to fill in those gaps. Even Fonsi himself is now, post-Bieber, serving up different genre flavors of his smash, including a rap-free Latin pure-pop version and a more clubby, percolating “urban” mix. Airplay, sales, and streams of these Fonsi editions will all contribute to the song’s Hot 100 status and, in turn, its Song of Summer contention. Come Labor Day, if “Despacito” has won the title, we’ll have to give props not just to Justin but to Luis Fonsi himself, who hustled for his crossover moment even before the Canadian radio magician smiled upon him.